Public sector pension administer Keva wanted to renew its stakeholder magazine. Its goal was to tell about the renewal of Keva and the entire occupational pension field, strengthen stress management and work-load coping skills, improve Keva’s public image and increase the readership of the magazine. The concept renewal that Keva carried out with Cocomms was based on a reader survey. People wanted the magazine to have a bolder take on issues. 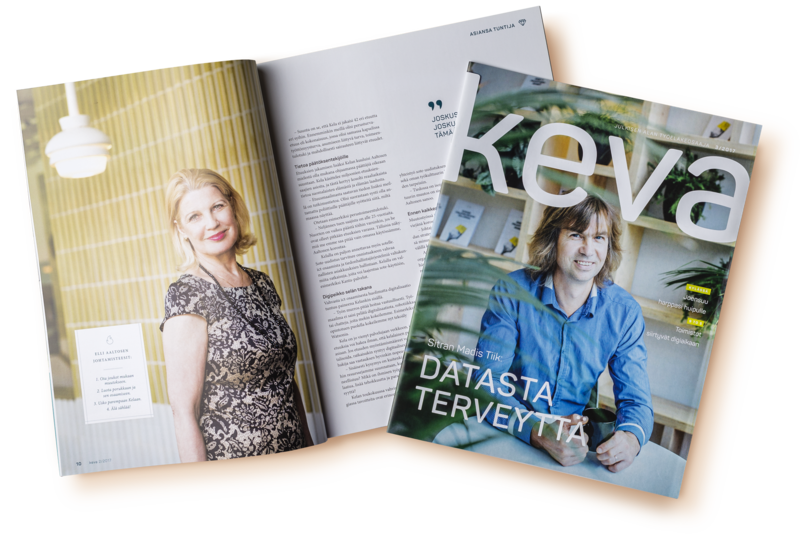 The visual image should match Keva’s new brand image, and digital content published on Keva’s webpage should supplement the print magazine. Cocomms’ team created a suggestion for the new magazine concept. The new layout based on Keva’s brand image was clear and fresh. The customer was pleased with the concept created together with Cocomms and the magazines based on it.